Numerous market research projects completed since 2001 illustrate that public attitudes about child abuse and neglect have remained largely unchanged for the past 20 years. Since the mid-1970s, public service campaigns (led by the nearly three decade partnership between Prevent Child Abuse America and the Advertising Council) have effectively raised awareness of the existence of the problem from less than 10 percent to greater than 90 percent. But, they have been unable to convince the public that prevention is possible and to motivate positive behavior change, at either the individual or societal levels, in support of prevention. 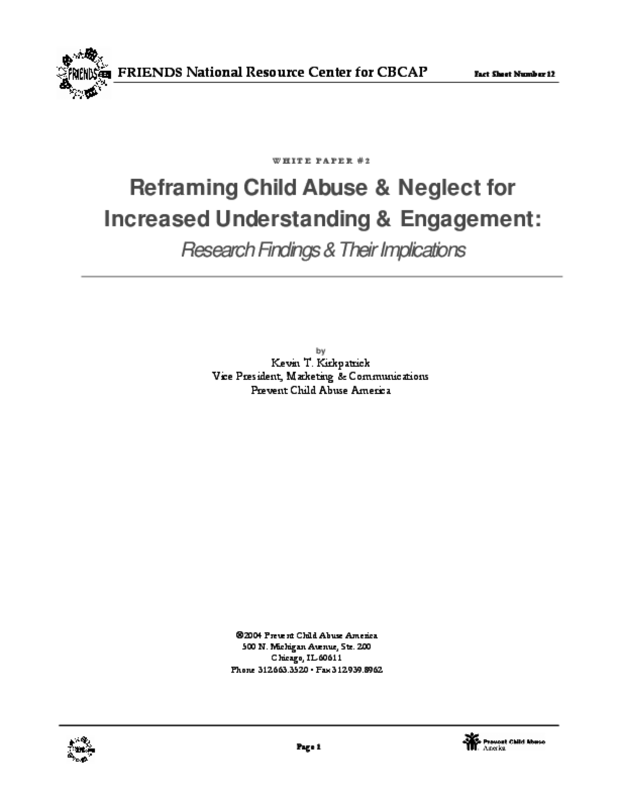 In early 2003, PCA America began to explore the concept of "strategic reframing" of the issue of child abuse and neglect prevention. The goal was to identify a more effective strategy for communicating about, and advocating on behalf of, child abuse and neglect prevention, based on a thorough understanding of the public's frame of reference on the issue.